The Diabetic Newsletter is widely considered the best diabetes-related newsletter available online. Sent every other Monday since 1999, each issue features diabetic recipes, articles, news about treatments, therapy, and medications, diabetes & health trivia, and useful information relating to cooking, health and diabetes. Whether you personally have diabetes or you’re just cooking for someone living with diabetes, The Daily Diabetic Recipe can make meal planning easier and add essential variety to your menu. One great, diabetic-friendly recipe is sent each and every day, complete with nutritional information and diabetic exchanges. Even if you’re not a diabetic, this is still a great source for quality recipes, especially for people interested in a healthier diet. It’s simple to signup and it’s free! 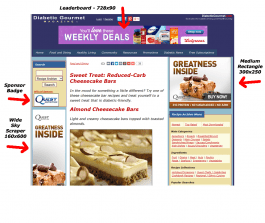 You can subscribe right now by visiting the Daily Diabetic Recipe website. People that don’t have access to email, or that do not wish to subscribe, can visit “The Diabetic News” website at any time for access to an extensive, searchable archive of all of our news features. Again, this is a free service.